For the past twenty-five years, the King's North Course at Myrtle Beach National has been the most requested and best recognized course on the Beach. 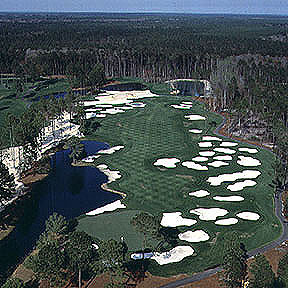 The par-3, 3rd hole with its island green and SC shaped sandtraps has become the signature hole for Myrtle Beach. King's North features some dramatic and unique holes. The par-5, 6th hole is nicknamed "The Gambler" and features an unusual island fairway which offers golfers a "risk-reward" short-cut to the green for a chance at eagle. The 18th hole, nicknamed "The Bull's-eye" by Golf Magazine, is a sight to behold. Over 40 sandtraps guard either side of the fairway and the green reaches out into a lake offering, at times, a very tempting pin placement.